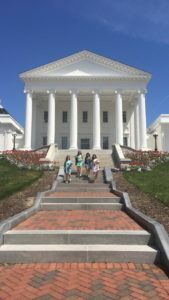 Model General Assembly (MGA) is a YMCA-sponsored program designed to introduce high school students to the legislative process of the Commonwealth of Virginia. Students in grades 9-12 may participate (with limited roles for 9th graders). 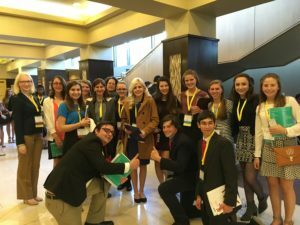 Each year, approximately 500 students from across Virginia travel to Richmond for the three-day session (in March or April), serving as elected officials, lobbyists and media. Statewide, more than 50,000 Virginia students have participated since the program began in 1948. Arlington began taking part in Virginia’s MGA in 2009, and now HBW is one of six schools in the county to send a delegation. In the fall, our student delegation prepares various student-written bills to introduce to the assembly based on existing laws in our state. Students work throughout the year to research, support, and debate their proposed bills. Student participants meet about twice a month (usually during TA on Thursdays), and all are expected to attend the culminating conference in Richmond. During this three-day government simulation, legislation is debated in committees and on the floors of the Senate and House of Delegates. Interested students should contact H-B Woodlawn sponsors Carolyn Crumpler (carolyn.crumpler@apsva.us), Catherine Frum (catherine.frum@apsva.us), or Liz Waters (liz.waters@apsva.us)!